Spaghetti Bolognaise is one of our favourite dishes - we like it because it's filling and it's yummy - but it can be expensive! So we came up with a recipe we think you'll enjoy. It's got only the very basic ingredients but isn't lacking in flavour, and we really hope you enjoy it as much as we do! 1) Begin by pouring a tablespoon of oil into the frying pan. 3) Once your beef is fried, you can put your spaghetti on to boil in a pan of salt water. 4) Add the tin of chopped tomatoes and tomato purée to the frying pan with the beef. Then add the garlic, salt and pepper to taste. Leave this to simmer on a low heat. Stir occasionally. 5) By the time your pasta is cooked your bolognaise sauce should have reduced quite considerably - you want the result to be saucey but not watery. Make sure it has enough seasoning before you serve it. 6) Drain the pasta and portion. Add the meat on top. Q. Do I have to use spaghetti? Can I use any pasta? A. Of course you can! We had spaghetti in the cupboard, so I used it. Q. If I wanted to add mushrooms and onions, when should I do this? A. If you want to add onions, mushrooms and any other vegetables you should do this after frying the mince. Fry your mince first, then remove from the pan. Fry the onions until soft. I don't like mushrooms, I never cook them, but I'd add these briefly to the pan to cook evenly before adding the mince back in. Continue with the recipe from there. Q. Shouldn't I drain the fat out of the minced beef once it's cooked? A. Normally I would - I do what I can to lower the fat content of my meals. But since we used fairly lean mince to begin with there wasn't too much in there. I didn't drain the mince because in recipes I found through a Google search they often suggest you use a beef stock cube for flavour. I'm not about to buy those, since it's pretty much the same thing, so the fat from the beef you already have will do just fine. But you can drain if you wish. Q. Why should I use the herby type of tomato purée? 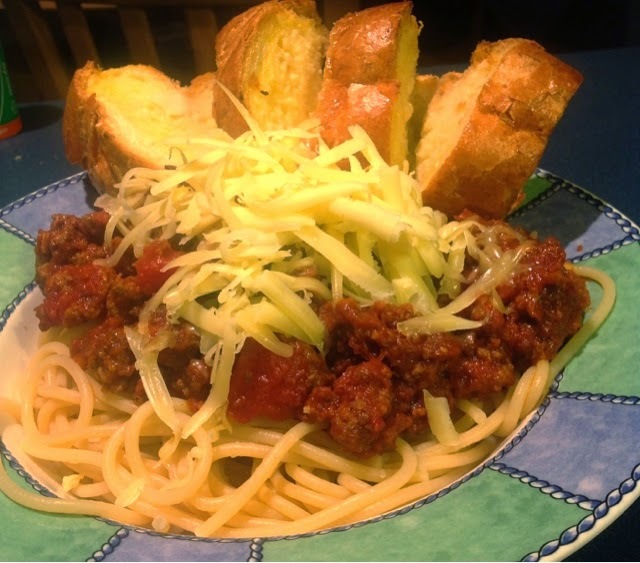 Let us know how your Spag Bol turns out - we're keen to hear your thoughts and suggestions!